As the official Journal of the Grassland Society of Southern Africa, the African Journal of Range & Forage Science is dedicated to publishing quality original material that advances rangeland ecology and pasture management. The journal now aims to publish research of international importance from any region, but as an African journal, it is particularly interested in research from Africa and relevant to the continent. The journal has now revised its aims and scope to expand its reach further. “The Scientific Board have worked actively to expand the reach of the journal beyond Africa. The Journal receives a significant number of manuscripts from non-African origin, in particular, South America”, said Editor, Dr Pieter Swanepoel. The journal promotes both science and its application and authors are encouraged to explicitly identify the practical implications of their work. “The African Journal of Range & Forage Science is already widely known in Africa and gaining international recognition. With the new aims and scope, we hope to attract high quality submissions from other regions to stimulate even wider exposure and readership of the Journal,” Dr Pieter Swanepoel stated. 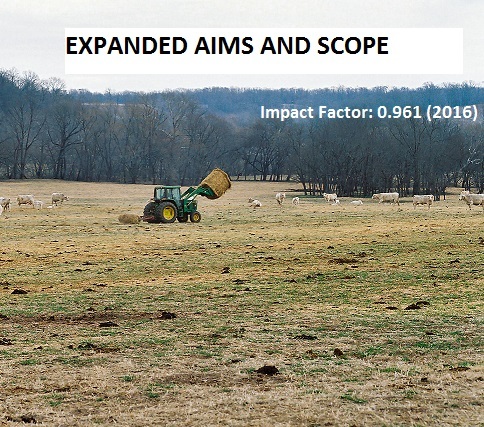 The journal serves as a platform for academic researchers, practitioners, and policy makers to share and discuss internationally important and novel findings that advances rangeland ecology and pasture management. “The new aims and scope also brings forward opportunities which will stimulate collaboration among researchers in Africa and elsewhere in the world,” said Dr Pieter Swanepoel. Read more about the aims and scope, submitting to the African Journal of Range & Forage Science and the instructions for authors here.